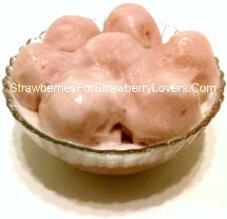 Use this strawberry sorbet recipe to make your own homemade strawberry ice dessert! First, pour the sugar, the lemon juice, the orange juice, and 1 1/2 cups (375 mL) of the water into a pan, and place the pan over medium heat. Stir everything together in the pan until the sugar dissolves, then set this solution off the heat and allow it to cool. The next thing to do is to put the strawberries in a blender and puree them. After that, add the remaining 1 cup (250 mL) of water to the blender and blend for 10 seconds. Wait another 10 seconds so that most of the seeds will settle out of the strawberry and water blend. Then pour the strawberry and water blend into the pan, being careful to leave the seeds behind, in the blender (discard the seeds). Stir the strawberry and water blend together with the sugar and juice solution to complete the sorbet mix. Pour this mix into an ice cream maker and process the sorbet as instructed by the ice cream maker's manufacturer. And it's finished! Makes a bit over 2 quarts (2 L). Eat your sorbet, and smile! And when it's all gone, just make some more with this recipe from StrawberriesForStrawberryLovers.Com, Home of the World's Happiest Fruit!